A federal judge in New Orleans has postponed a civil trial involving a trucking accident lawsuit after the plaintiffs, who in court documents called themselves victims of the accident, filed affidavits asserting their Fifth Amendment rights to not incriminate themselves at trial due to a possible “ongoing criminal investigation” into the accident, and possibly other accidents. Attorneys for the trucking company allege the accident, and possibly as many as 30 other accidents in the New Orleans area, was staged. The affidavits did not specifically identify the law enforcement agency conducting the investigation, but the three plaintiffs said they will decline to testify if the trial proceeds. “I aver that after being informed of the aforementioned it is my intent to assert my Fifth Amendment right against self-incrimination if called to testify relative to the Nov. 13, 2017, accident and/or any conversations pertaining thereto or any accidents that may be the subject of a criminal investigation,” each of the three plaintiffs’ affidavits said. The trial, which had been scheduled to begin March 18, has been continued until the investigation is complete, but Senior U.S. District Judge Ivan Lemelle said he would conduct a status conference on April 30. “Parties shall notify the court within 10 days of receipt of information of any closure of a criminal investigation or closure of a criminal prosecution, if any occurs,” Lemelle wrote. 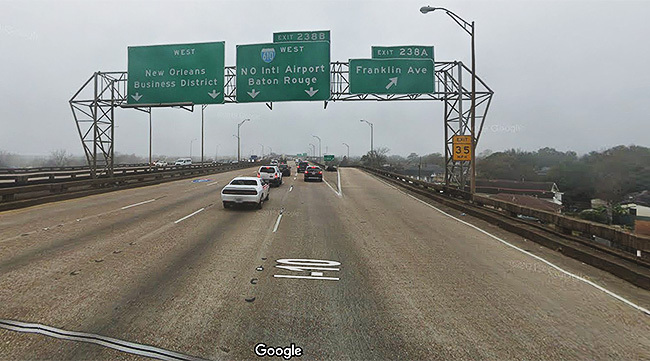 The alleged accident that prompted the lawsuit occurred on Nov. 13, 2017, on Interstate 10 in New Orleans, when a motorist flagged down Whitestone Transportation driver Robert Runnels to inform him that his 18-wheeler had sideswiped a car. They also are seeking damages for medical expenses, mental anguish, loss of enjoyment of life, physical pain and suffering, and inconvenience. But attorneys for the trucking company allege the accident was staged for the intention of reaping a large financial court settlement. In their course of investigating the accident, Whitestone attorneys have alleged in court documents that they have uncovered evidence that more than 30 other accidents in New Orleans had similar “factual scenarios” and are believed to possibly have been staged. But Edwin Shorty Jr., a New Orleans attorney representing the plaintiffs, said he has seen nothing yet to substantiate the trucking company’s claims. Shorty said he first learned of the possible investigation in court filings by trucking company attorneys. Attorneys for Whitestone Transportation declined to comment for this story. Chance McNeely, executive director of the Louisiana Motor Transport Association, said in an interview earlier this month that in such cases the deck typically is stacked against trucking companies.